We’d love your help. Let us know what’s wrong with this preview of Don't Go to the Cosmetics Counter Without Me by Paula Begoun. To ask other readers questions about Don't Go to the Cosmetics Counter Without Me, please sign up. Ugh. I'm all for consumer protection and everything, but I can't believe that she calls this an unbiased book when it's clearly biased to her very own skin care and makeup line! Makeup and skin care is pretty subjective, since everyone's skin and personal style is so different. I don't mind fragrances, but she immediately marks anything fragranced an entire grade lower. Lame. It's really just a book about products appropriate for her skin. I guess if I had been living in a cave and had never was Ugh. I'm all for consumer protection and everything, but I can't believe that she calls this an unbiased book when it's clearly biased to her very own skin care and makeup line! Makeup and skin care is pretty subjective, since everyone's skin and personal style is so different. I don't mind fragrances, but she immediately marks anything fragranced an entire grade lower. Lame. It's really just a book about products appropriate for her skin. I guess if I had been living in a cave and had never washed my face or been to a drugstore before, I would find this a useful tool. But I have so it's not the end. This is a MUST-HAVE for every woman so we don't get conned by the beauty industry. I have saved thousands of dollars since buying this book last year and I frequently use it as a guide when choosing products for myself and my family. Paula Begoun has provided me with effective solutions to rid my skin of acne and eczema. I have been acne free for a year now and my skin is luminous and hydrated. Even though I am 26 I can still pass for 19. I look better than I have in years and I only spend penni This is a MUST-HAVE for every woman so we don't get conned by the beauty industry. I have saved thousands of dollars since buying this book last year and I frequently use it as a guide when choosing products for myself and my family. flawed and quite un-scientific. Most of her claims are blown out of proportion or just taken out of context when you look at the actual studies. They should do a larger review of products in categories so you can choose the best moisturizer, eye product and so on. THere is a brief one - but it's not very good or comprehensive. The book is also poorly written and is all opinion - I want science & clinical trials!!!! This is the 7th edition and you still don't have things down right - this had so much potential - but fell flat. The biggest obstacle for finding a quality beauty product is interpreting the glossy marketing which generates most of the cost. Begoun helped me develop a healthy skepticism and got me into the habit of reading the back label before the front. Once I realized every bottle of goo is made up of mostly water and promises, I was willing to let go of all the pathos and begin to understand what I'm buying. The book begins with a broad spectrum chapter designed to educate about the powerful psycholo The biggest obstacle for finding a quality beauty product is interpreting the glossy marketing which generates most of the cost. Begoun helped me develop a healthy skepticism and got me into the habit of reading the back label before the front. Once I realized every bottle of goo is made up of mostly water and promises, I was willing to let go of all the pathos and begin to understand what I'm buying. The book begins with a broad spectrum chapter designed to educate about the powerful psychology behind beauty marketing, the language designed to persuade, and some explanation about how skin works and what it needs to be healthy and beautiful. Begoun has made a reputation of being a really tough sell. Her product reviews are brutal and concise, with clear overarching standards on the quality of the active ingredients as well as the practical ease of use. She's quick to point out claims which lack credible support. I found out about all of the products I was using and found some better products to use instead. No wonder I wasn't liking my face wash - when tested it doesn't remove makeup, but that's not on the label. No wonder I wasn't happy with my moisturizer - it didn't have any skin identical ingredients. This book was fantastic. I'm amazed at the level of research that went into each brand and product. She covered all major lines available in department stores as well as stores like Target and Walmart. I found out about all of the products I was using and found some better products to use instead. No wonder I wasn't liking my face wash - when tested it doesn't remove makeup, but that's not on the label. No wonder I wasn't happy with my moisturizer - it didn't have any skin identical ingredients. This book was fantastic. I'm amazed at the level of research that went into each brand and product. She covered all major lines available in department stores as well as stores like Target and Walmart. You can read about each ingredient and what it does. She has a great system to help you understand what works and why. This is a very large and detailed reference book for buying cosmetics. I looked at a while ago and read a lot of it. Paula Begoun tells you what cosmetics are animal-friendly, what cosmetics actually sort of do what they say they do and what cosmetics are merely fancy (and much more expensive) versions of less expensive ones. 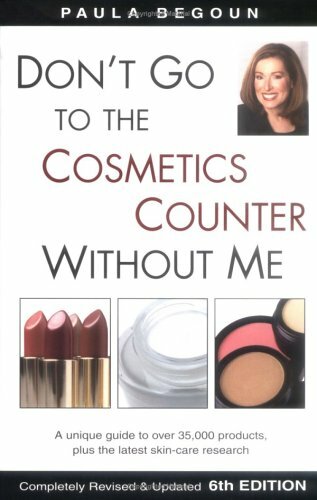 Even if you have only a passing interest in cosmetics, this is a very interesting and helpful book to consult. I certainly found it to be an eye-opener. This review has been hidden because it contains spoilers. To view it, click here. I liked this one because it explained few things i personally didn't know, like that cremes in jars are not as good as ones in tubes because of fingers always touching it and oxidizing. I also loved alphabetical order of companies, it was sad to see some of my own products to be on the bad list, but now atleast I know which ones not to buy! I also actually consider to buy this book to keep or just use website. I like this book, but it annoys me as well. I am skeptical of the quality of a lot of big cosmetics brands too. However, she seems to hate everything, even natural products are bad in her eyes. I can understand making your own brand because you're not happy with what's on the market, but I don't always agree with her viewpoint. I hated the way this book was organized! I really didn't get anything out of it because I wasn't willing to read the entire book cover to cover. I read a previous edition of this and remember that it was much easier to follow. Despite its length, it doesn't take long to get through. I just read the introductions and then skimmed through each brand to see which products she most recommends and why. This is a helpful reference to have around, and definitely has changed how I look at the cosmetics industry. I thought this would help me to decide what type of moisturizer, foundation, etc to buy and all it did was confuse me even further. Plus...I just figured out that you can find most of the info that's in the book, on her website cosmeticscop.com. This book is no more helpful than your own common sense. Her self-promotion is so obvious and so wrong. There are lots of super sources out there. If I reviewed every product listed on Amazon like she does in this book, the other members would be on a campaign to get me banned for trolling. I can't emphasize enough how useless rating a product on ingredients alone is. Different fillers, quantities, packaging and preparation can and do have different effects on how any product performs, including makeup and skincare. But because her rules are more important than the outcome, she relies almost exclusively on ingredient lists. If she tried something it was likely on the back of her hand, not in the way it was intended. So much for complaining about cosmetic companies' testing when she can't even be bothered to do decent testing of her own. Even if she wasn't peddling her own stuff, it's just too much information for one person or even a small group of people to tackle. One person, one skin type, one ethnicity, performing one test one time (if that) is just not enough to get an accurate picture of what a product will or won't do. Her incessant complaints about shimmer & color make most of the makeup reviews useless since this is so subjective. I applaud her enthusiasm for sunscreen, but her criticism for products that don't contain it seems like overkill and is rather arbitrary in some cases. She completely ignores the importance of a small amount of sun for vitamin D synthesis in skin. If you're going to wear a lead suit every time you go outdoors like she advises, you ought to at least ask your doctor about a vitamin D supplement. She says we should look for a moisturizer that has antioxidants, cell-communicating ingredients and so forth, but does not provide even basic lists. Ingredients that she does name are buried in a sea of text. The review for Urban Decay Primer Potion states that you can get the same effect from a good, silicone-based concealer, but she doesn't name any. She goes on to waste the space complaining about shimmer, sometimes finding it in products that I can't find any shimmer in at all. She would have been better off including a symbol indicating "this product contains shimmer," and using the extra space to elaborate on performance. Instead we get a condescending attitude toward anyone who likes shimmer, and that attitude extends to anyone who disagrees with her. She provides a list of "irritants," but it seems to be based on her own biased opinions against essential oils, etc. Her biggest irritant is irritation, and apparently everything except petroleum by-products and her own questionable line irritate her. Many of the reviews themselves only consist of a couple of sentences-- hardly enough information to help someone evaluate a product. Any brand that's halfway decent almost always gets the dollar symbol indicating that the product is outrageously expensive. Even if it doesn't have a dollar sign, she sometimes still wastes review space criticizing the price. I happen to agree that a lot of stuff out there is a rip-off, but this is more overkill. Listing the price and amount of product you get would be more than enough for me to decide on my own. Her general view seems almost communist-- everyone should use cheap skincare, everyone should wear the same matte neutral makeup colors, and she acts like she is there to protect us from the big bad corporations. (Maybe she should run for President.) It's a great business strategy-- make everyone think you're a consumer advocate and expert in the field, trash the competition and then introduce your own products. The format is as obsolete as her early 90s views on matte, neutral makeup, blue eye shadow, shimmer, natural ingredients, essential oils and fragrance. A database like this should be in an online, searchable format that is continuously updated and expanded as new products and cosmetic advances are made. I think this is what she is doing with her new site, but I don't recommend THAT either. Bad information is bad no matter how well-presented it is. I would recommend following online as it's more up to date. Once books like this are published, they are outdated by an ever changing industry. While there were many commercial lines that were listed; not all their products were. Also not enough attention was given to "natural" "organic" product lines but I think this was a resource for trying to pick the best of the worst off the counter. Very good information about skin care and what to avoid! I read the newest edition a few months ago.I am a fan of her, and I believe all her books are good. Cons:The one thing that bothered me was there were some areas that she gave no background about.She covered some areas and some she did not cover well. One example is where she talked a lot about natural ingredients that hurt the skin and explained they were dangerous because they were capable of giving a cytotoxic or photo toxic reaction in the reviews. I wish she had explained what these ingredie I read the newest edition a few months ago.I am a fan of her, and I believe all her books are good. Cons:The one thing that bothered me was there were some areas that she gave no background about.She covered some areas and some she did not cover well. One example is where she talked a lot about natural ingredients that hurt the skin and explained they were dangerous because they were capable of giving a cytotoxic or photo toxic reaction in the reviews. I wish she had explained what these ingredients were earlier in the book like how she did for other things like cell communicating and anti irritant ingredients and how they could do this in one of the earlier chapters. Although, it does not make the book any worse I would have liked some information on colorless makeup that transforms to your skin color when you put it on and scrubs and lotions that heat up when you put them on (zeolites) in cosmetics since these things were talked about in her reviews, and some of the cosmetics had these things in it. Pros: The book was thoroughly researched and I learned what ingredients you do not want in your skin products and make up. There was also exciting news on some news on ingredients being used in cosmetics that will make them feel and look better and be more healthy for your skin. In addition the writer Paula is a great writer she is humorous and admits when she's wrong and is always honest. Her analogies are also helpful. I recommend this book. It's a very useful source of information but it doesn't cover a big deal of brands sold in Europe or cover just some strange selected group of products within a brand. For instance in her review of Nivea P. Begoun doesn't write a single word about numerous sunscreen products of the brand. It makes me wonder whether the brand sells such products in the USA or what might be a reason to ignore them... That's why I don't give the book the highest rate - when the author goes international the book mu It's a very useful source of information but it doesn't cover a big deal of brands sold in Europe or cover just some strange selected group of products within a brand. For instance in her review of Nivea P. Begoun doesn't write a single word about numerous sunscreen products of the brand. It makes me wonder whether the brand sells such products in the USA or what might be a reason to ignore them... That's why I don't give the book the highest rate - when the author goes international the book must be international, too. The author marks her own products exclusively as the best but there are several web-sites (including Paula Begoun's own web-shop) where you can find the customer's reviews and ratings... all kinds of satisfied and disappointed ones... Well, it shows that criticizing is much easier than creating. You can simply ignore her products (9 pages of 1110) - the book is not about how great they are comparing to others, the book is about the right criteria of choosing a good product for your needs. The author always explains her reasons of rating so you can think for yourself whether they matter to you or not when P. Begoun writes about the best, good or average products. This is a fantastic book to use for shopping for all kinds of face cleansers, lotions and cosmetics for men and women. Products are tested and rated for effectiveness, hypo-allergenic properties and price. While the author does sell her own line of products (which I have never tried) her reviews of every product seem thorough and the recommendations have all turned out well for me. Personally, I want to take good care of my skin, with a little hassle as possible, and for a reasonable price. This This is a fantastic book to use for shopping for all kinds of face cleansers, lotions and cosmetics for men and women. Products are tested and rated for effectiveness, hypo-allergenic properties and price. While the author does sell her own line of products (which I have never tried) her reviews of every product seem thorough and the recommendations have all turned out well for me. Personally, I want to take good care of my skin, with a little hassle as possible, and for a reasonable price. This is a great way to stay current with the constantly changing offerings from your favorite brand, or look for something new to try. In make-up especially I find that when I DO find something I like the formula, color or features change and every time I shop I'm starting all over. This is a good way to search by skin type and how well different types of make-up work on dry vs. normal or oily skin. I've always been a fan of cosmetics, but I could never really understand how a company could make claims about their product, and yet it never worked as described. Thanks to Paula, I understand how the FDA does not control anything about the entire cosmetics industry, and how the way cosmetics companies market their products is misleading, laughable, and occasionally dangerous. (False eyelashes in mascara commercials? Photoshop used on a model, whose picture is advertis This book changed my life. This is a great resource to find effective skincare and makeup products without having to deal with the hype of the marketing teams for each of the billion (it seems, anyway) companies out there trying to get our money. I have super sensitive skin and eczema and after trying some of the recommended products and learning specific ingredients and other things to avoid, I've seen an improvement. This is a great reference, but since she practically comes out with a new edition each year, I would def This is a great resource to find effective skincare and makeup products without having to deal with the hype of the marketing teams for each of the billion (it seems, anyway) companies out there trying to get our money. I have super sensitive skin and eczema and after trying some of the recommended products and learning specific ingredients and other things to avoid, I've seen an improvement. This is a great reference, but since she practically comes out with a new edition each year, I would definitely borrow this from the library before you purchase it. She also has some resources online you can access. Paula Begoun is the founder and innovative force behind Paula's Choice skin care and cosmetics. She is the author of 18 self-published books, the best-selling ones are on skin care. She has a flourishing website selling her books and her cosmetics. The author has appeared on many chat shows and Paula, nor any of her team, are dermatologists or qualified in any way medically.